The number of completed projects, technology and process speak for NELSON’s respected experience in the remediation industry. Nelson Environmental Remediation Ltd. is the only Canadian company which performs on-site, ex-situ thermal treatment of hydrocarbon and organic compound contaminated soil, returning the clean soil to beneficial re-use. NELSON is a world leader in its industry and has completed projects in extreme conditions around the globe. Our experienced staff along with our guaranteed results bring certainty to large scale remediation projects. NELSON’s internal remediation technology and industry leading processes and performances have driven strong growth and reinvestment into ongoing improvement and research into emerging contaminants. 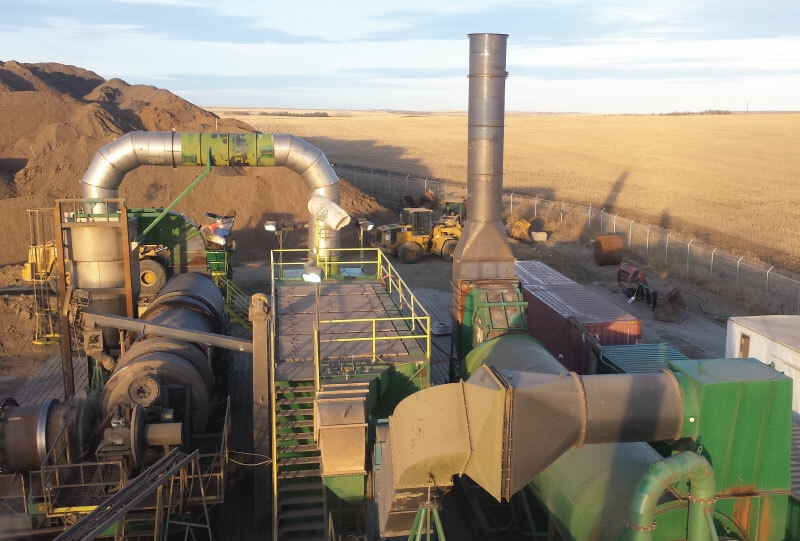 Our process eliminates client liabilities associated with transportation of contaminated material to landfill or other off site locations and sourcing and transportation of clean backfill. Thermally desorbed soils result in a positive social outcome of beneficial re-use availability and reducing the possibility of contaminated material sitting in landfills. The result is recycled soil with enhanced community partnerships for our stakeholders. The company was created by Darryl and Warren Nelson from the family’s earth-moving business which served Western Canada’s oil and gas industry since the 1960s. The history of NELSON has been of earth moving, soil handling, construction, and agriculture since the 1960’s. Providing soil remediation via thermal desorption units (TDU) technology since 1994 via Nelson Environmental Remediation Ltd.
NELSON has extensive industry experience, processing more than 2,000,000 tonnes of contaminated soil on locations across more than 12 time zones (from Hawaii and throughout continental North America, to Europe and Africa) and, in conditions ranging from extremes Canadian Arctic winters at -50ºC, to the tropics at +40ºC. NELSON has treated soil contaminated with materials from light Bakken crude to heavy-end laden coal tar on soil varying from sandy to heavy clays. As well as providing remediation of contaminated soil to beneficial re-use, NELSON provides full-service operations, performing excavation, soil handling, reclamation and other services. The Alberta business also specializes in large scale clean-ups, often remote, where the value of on-site liability elimination is realized at costs comparable to non-sustainable options such as off-site landfill disposal that simply defer liability. The Thermal Desorption Unit process provides an on-site sustainable soil remediation technology that conserves the soil on site for beneficial re-use while eliminating transportation liabilities, delivered under a broad range of conditions.